One of our favourite topics is Dinosaurs. I’ve loved them since I was a child and visited the Natural History Museum in London seeing the huge Brontosaurs in the main hall that was it I was in love with them. 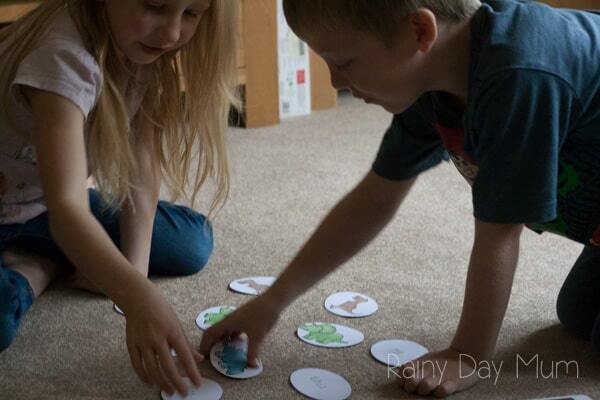 It seems the love of them has passed down to my children and over the years Dinosaurs have featured a lot on Rainy Day Mum especially in our Storybook Summer Series as well as a number of times on the Virtual Book Club for Kids. 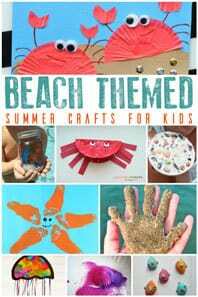 Taking the theme and extending it, crafting, reading, learning and playing with it helps children to understand different concepts, learn quicker and have fun instilling a lifelong love of learning in them from an early age. 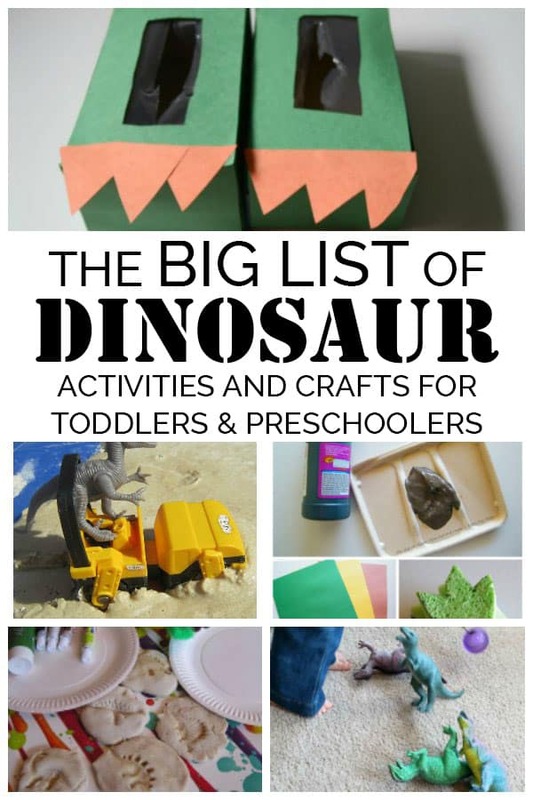 So here’s a huge selection of Dinosaur Crafts and Activities for Toddlers and Preschoolers (plus a few for some older children too). 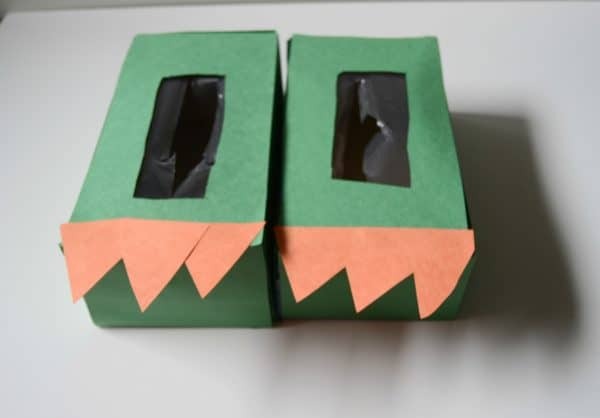 I had to start this off with Dinosaur Arts and Crafts and first our favourite easy dinosaur craft is DIY dinosaur feet. 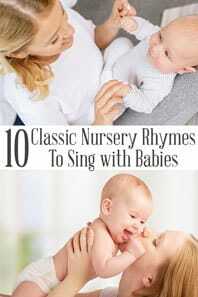 They are so easy to make you can do them spur of the moment when the kids want to stomp like a dinosaur. 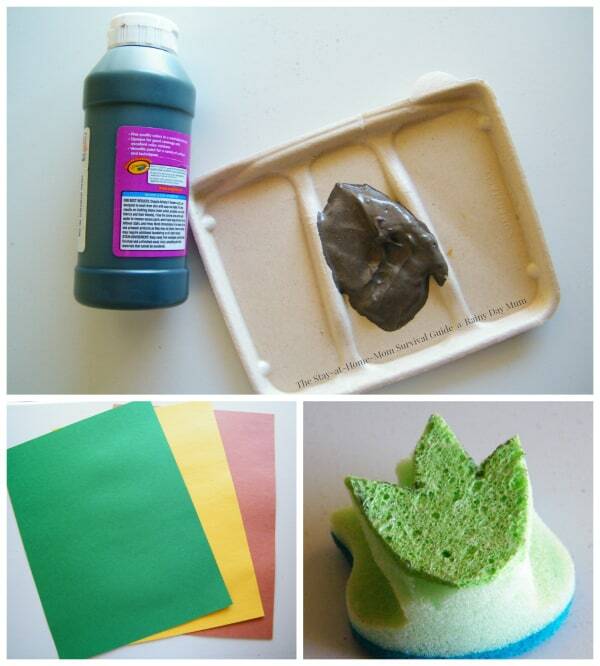 On a much smaller scale, you can make these DIY Dinosaur Footprint stamps and stomp, and stamp around the paper. Wouldn’t these just make the most perfect wrapping paper for a dinosaur loving child! 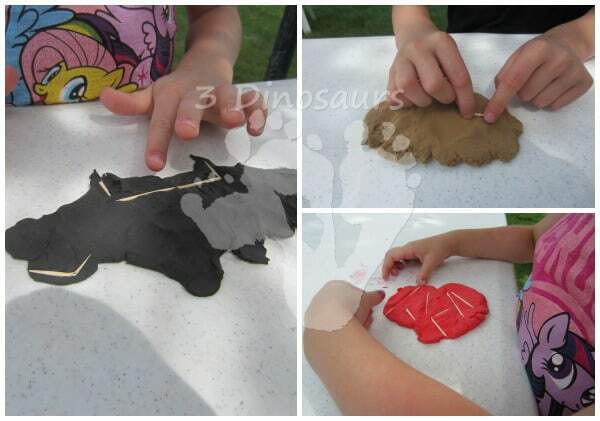 Create your own Salt Dough Dinosaur Fossils and if you use the quick Salt dough recipe it will be minutes before the fossils are formed instead of millennia. 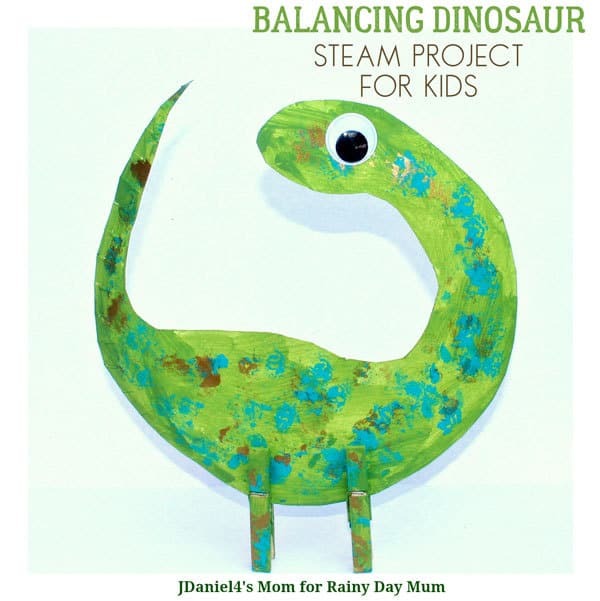 Part learning, part STEM challenge and part craft this Balancing Dinosaur Challenge is fun for kids to make and do. 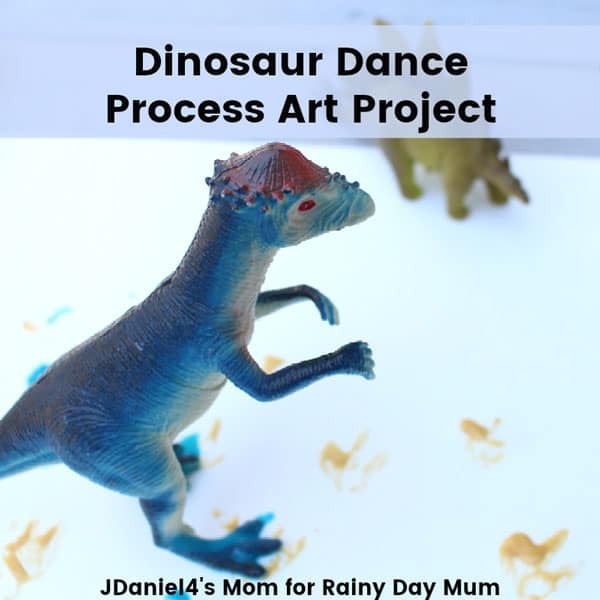 This process art project is ideal for toddlers and preschooler – a bag of your dinosaur toys and you are ready to go. 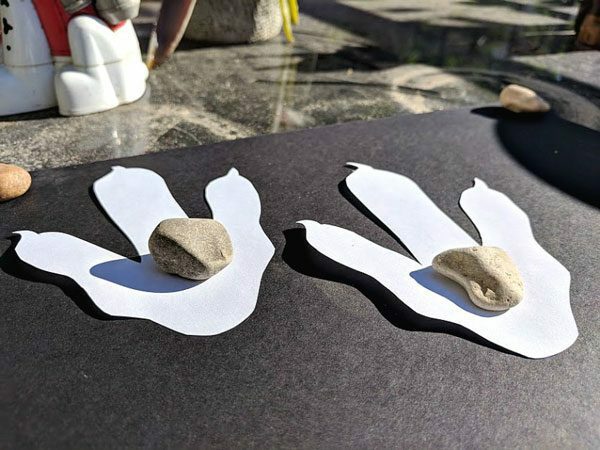 Harness the power of the sun and create some Dinosaur Foot Prints this summer ideal for easy to set up mess-free craft for kids. 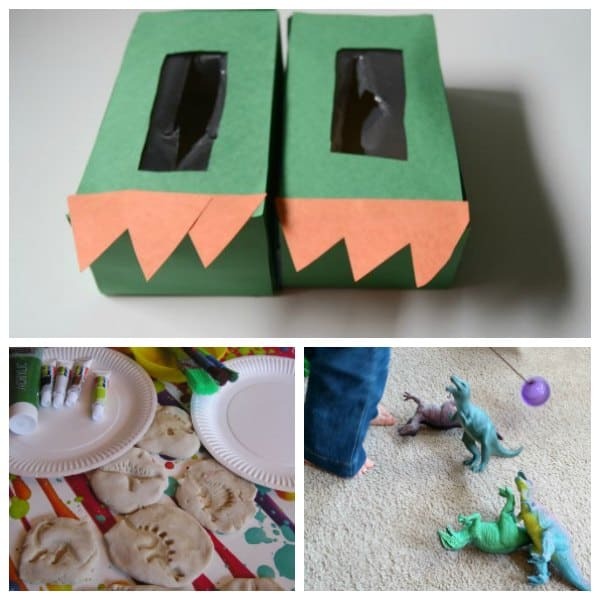 Such a fun, messy cardboard box craft and you could easily use the Cardboard Box Dinosaur to eat numbers, colours, letters or words as well supporting learning at the same time as having fun making. 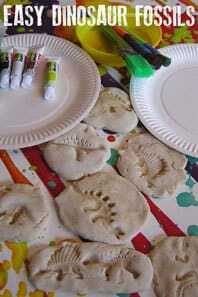 Not all of the crafts have to be permanent these dinosaur fossils and imprint activities are short and sweet, easy to set up and easily cleared away as well perfect for quick dinosaur themed activities for kids. I’m never sure whether to include cooking as a craft but as we only have 1 dinosaur recipe I thought I might as well these Chocolate Chip Dinosaur Cookies are perfect to eat whilst you read one of our favourite Dinosaur Books Edwina the Dinosaur that didn’t know she was extinct by Mo Willems. 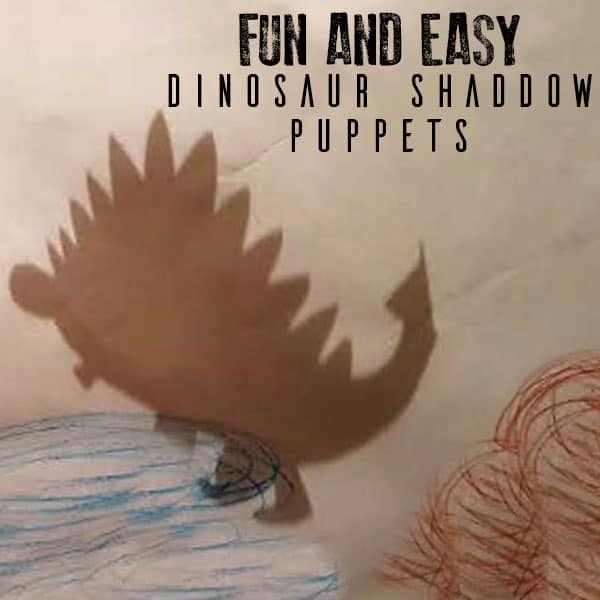 Create your own Dinosaur Shadow Puppets in this simple craft and play activity. 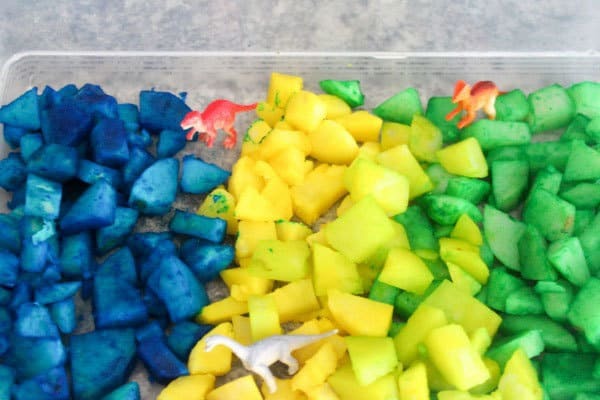 Excavation dinosaurs in different substances is such fantastic sensory play and we’ve shared a few over the years – the first is some dinosaur bones and fossils in sand. 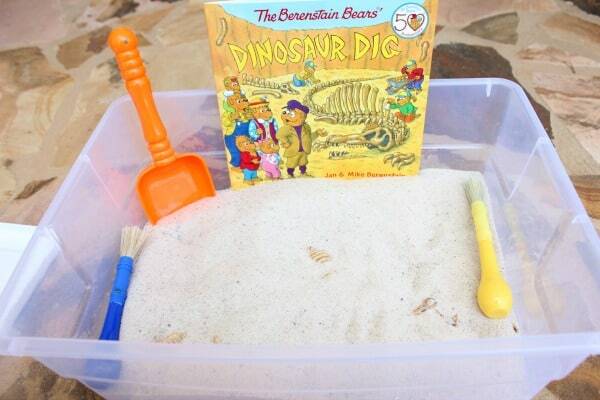 Have you used Kinetic Sand – this Dinosaur Dig activity includes a recipe for your own to make and play with. We love the Tuff Spot that is used as there is just so many different uses for it. 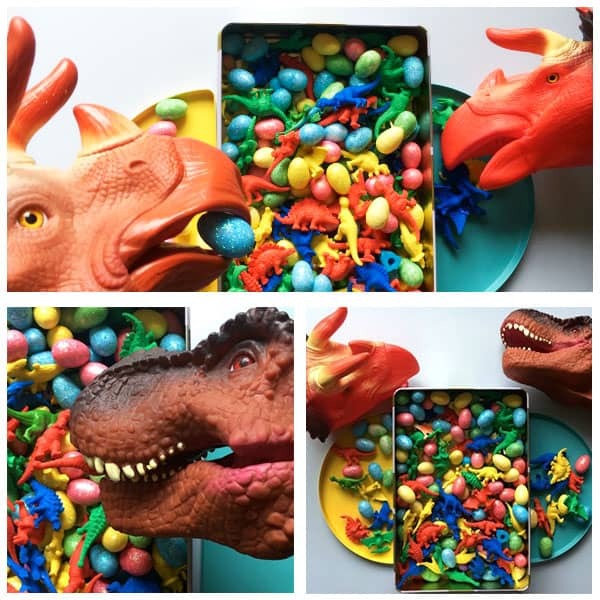 This taste safe dinosaur sensory bin is perfect for toddlers that put everything in their mouths. They will love the vibrant colours and have fun with the kitchen utensils as well. 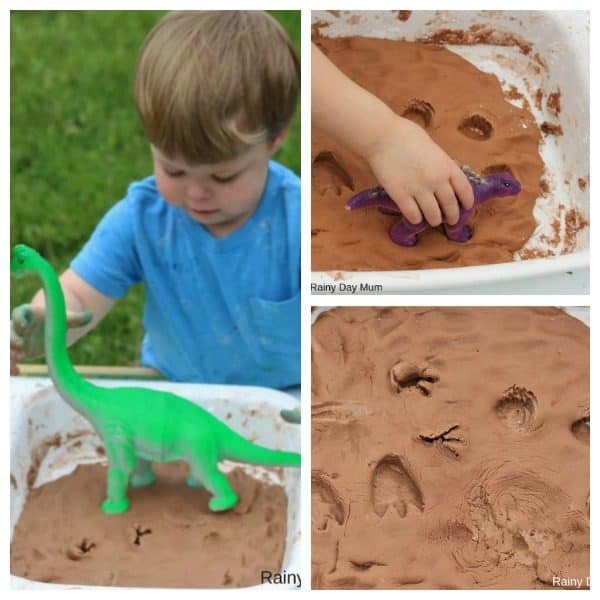 The kinetic sand in the Tuff spot was some sensory play on a grand scale but it doesn’t have to be this small sensory tub based on the book Dinosaur Dig and using dinosaur skeletons is a lot of fun as well. 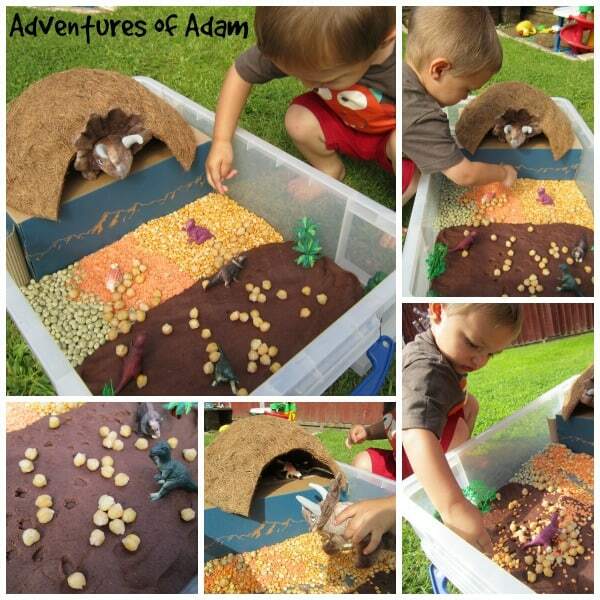 This dinosaur sensory tub combines different materials for some small world play as well as a sensory experience and again forms part of the storybook summer series and features a beautiful book too. Use the Water Table to create your Dinosaur Small World and use simple nature materials in the play with the toy dinosaurs. 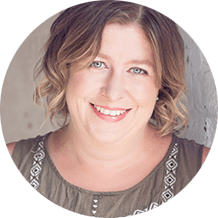 Fellow Mum Jamie who founded the fantastic Hands-on As We Grow has put together a set of activity plans for Toddlers called Play, and two different versions for Preschoolers – Engage and Learn and they are the perfect way for busy mums to plan their activities. 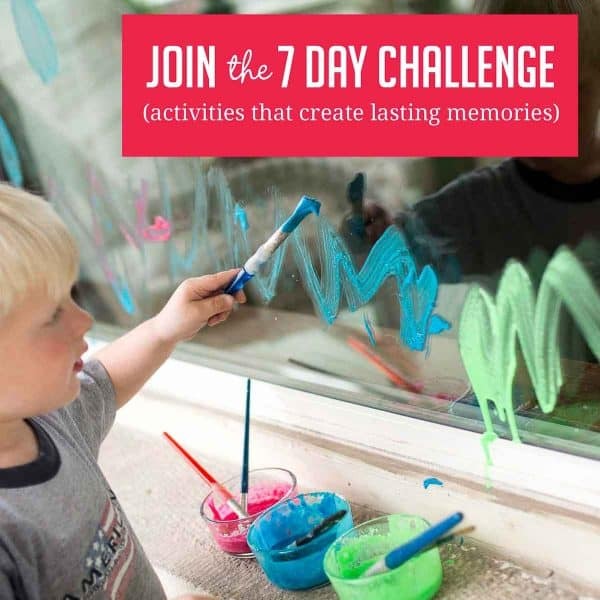 With 5 weeks of activity plans plus 5 extra bonus lists of suitable activities that you can dip into when you need even more this is an ideal resource for you to have at home to help you out and your children learn whilst they play at different ages. 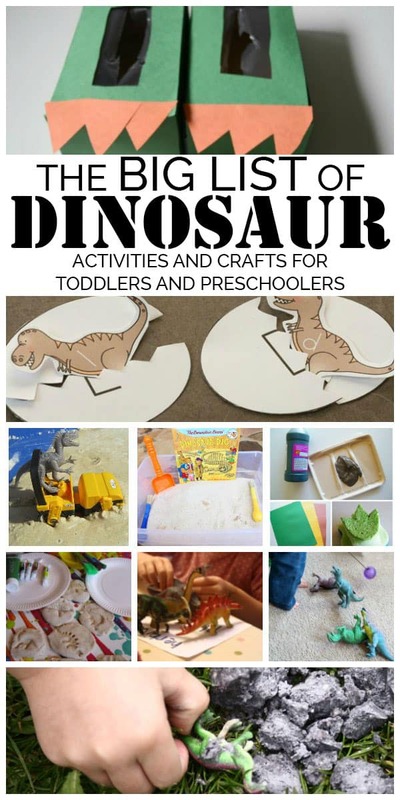 Dinosaurs provide such a rich topic to learn with and there are so many different activities that you can do. Just reading some of our favourite dinosaur books and then using them to inspire some literacy activities through to science investigations and maths. 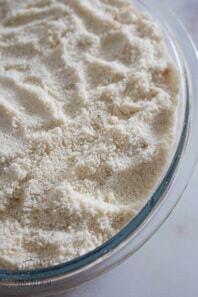 Learn how one of the forms of dinosaur fossils were formed in our Trace Fossil making in Edible Pretend Mud. Supporting fine motor skills as well as counting this DIY inspired Dino version of Hungry Hippos is a lot of fun to play together. This conservation-themed book and activity is based around a “dinosaur” that is out to destory the forest home of the creatures. 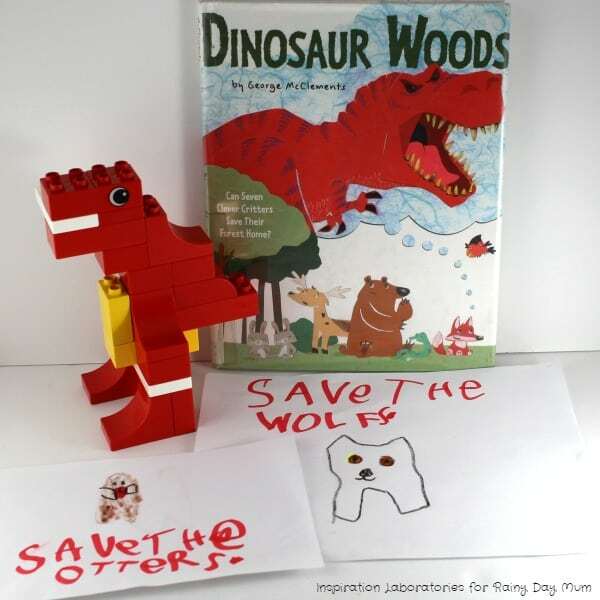 Creating the Duplo Dinosaur and then making some signs to save the forest is a good way to teach children about activism. 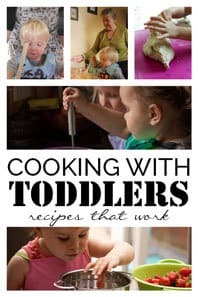 What did dinosaurs eat – how did they eat these questions provide some fun prompts for children to use to inspire them with fine motor skills for developing the muscles needed for writing through to creating a menu for a dinosaur picnic. Let the dino babies help your preschoolers to learn their upper and lower case letters with this literacy activity for them. 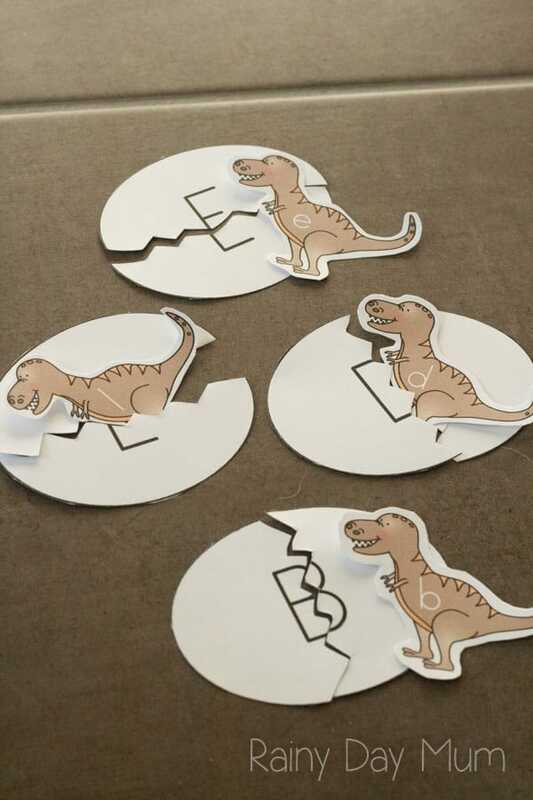 Included is a free printable dinosaur babies and eggs. Once they have the hang of letters you can help them move on and one of our favourite older kid activities this school year has been these High Frequency Dino Eggs. If your Dinosaur mad like my kids then you probably have quite a selection of dinosaurs. 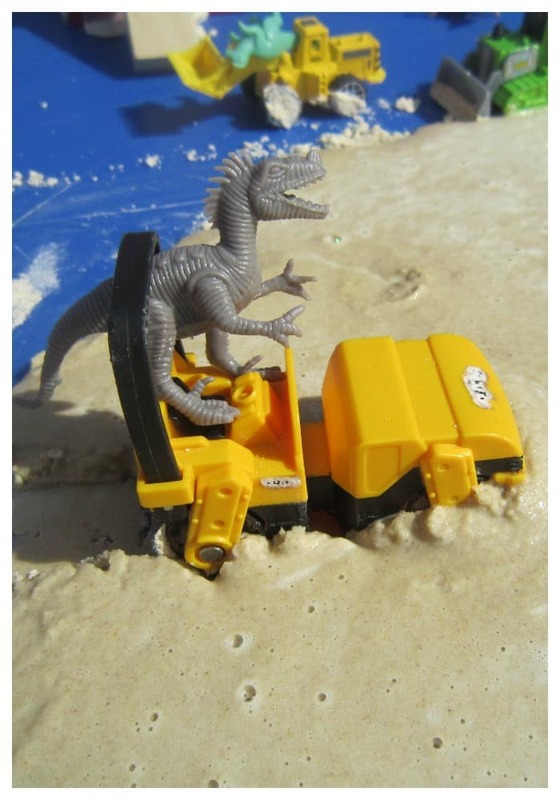 These Dinosaur maths questions are quick to set up and you can do them as you play with the children. Working on counting and addition. 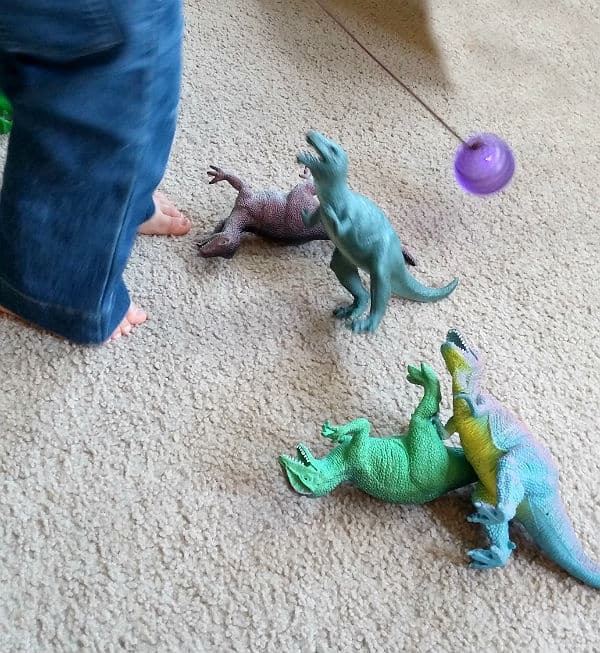 A simple preschool dinosaur science experiment to really find out about that ball at the end of the dinosaur’s tail. 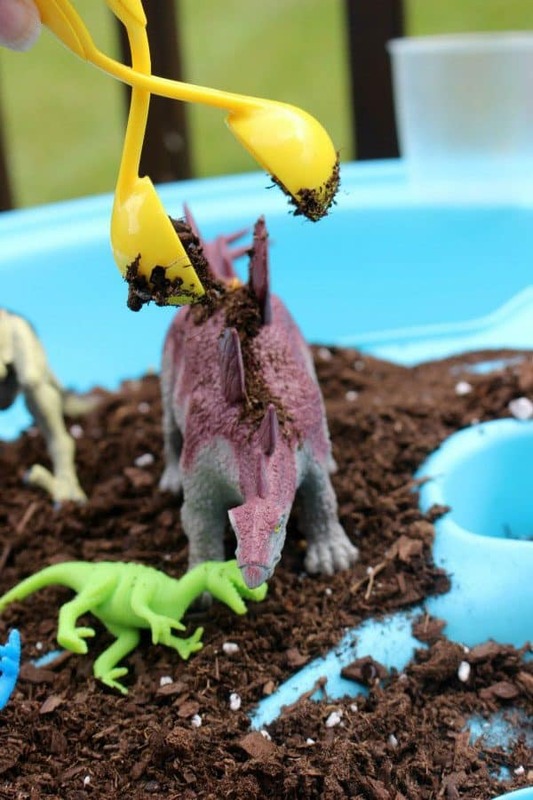 Get those dinosaur toys out again and have fun with this easy preschool science experiment. 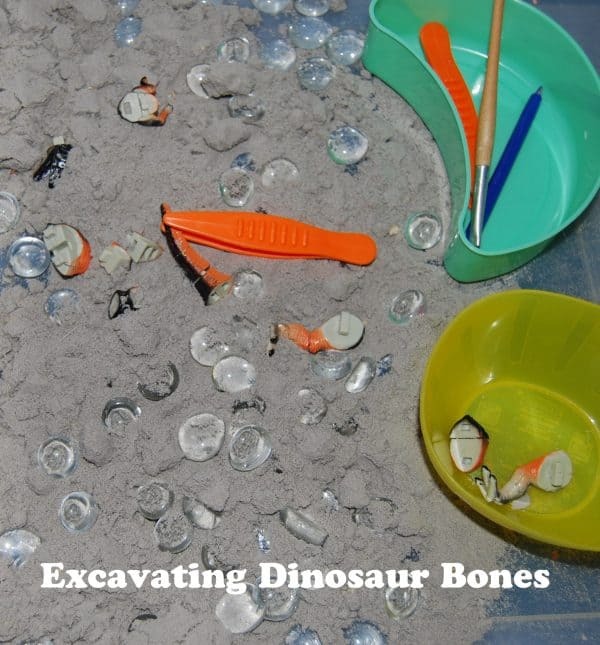 Discover how a paleontologist works by creating your own dinosaur eggs and the excavating the toy dinosaurs from them. 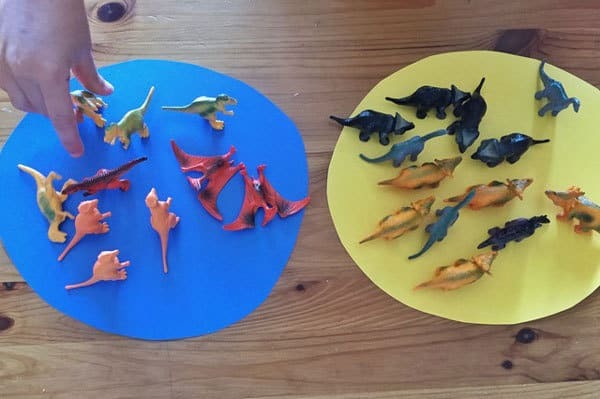 What did dinosaurs eat, are there ways to tell explore this and involve some sorting and classification at the same time using the dinosaur toys as you and your child learn which dinosaurs were carnivores and which dinosaurs were herbivores. 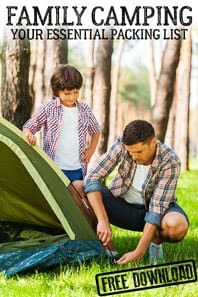 Once you’ve sorted by what they eat you can start to sort your dinosaurs by how many legs and feet they have – whether they are bipeds or quadrupeds. 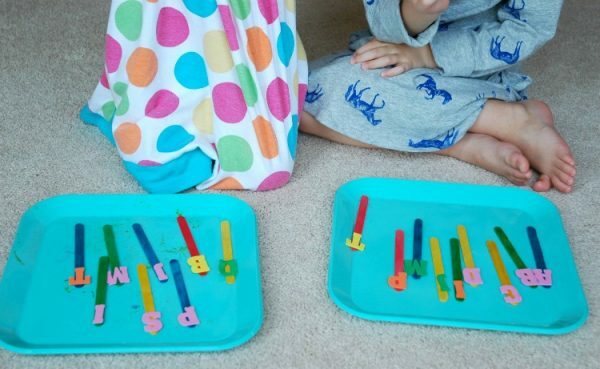 A double activity – learn your letters using those dinosaur names and have some fun with a Saturday Night Dinosaur Stomp gross motor game. Dinosaur Gifts and Products we recommend. We have included affiliate links to products and resources we recommend if you purchase via these links we may earn a small commission. 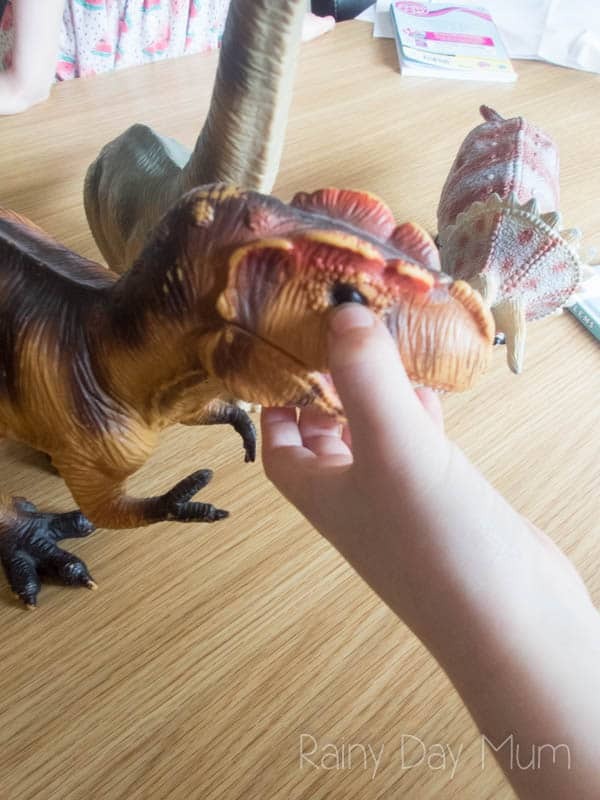 These jumbo dinosaurs are one of my favourite dinosaur toys – although we have smaller dinosaurs (like the ones that we used to create our Salt Dough Dinosaur Fossils) the jumbo dinosaurs are great for stomping and roaring as well as playing without in the garden and being able to find again unlike the tiny dinosaurs. 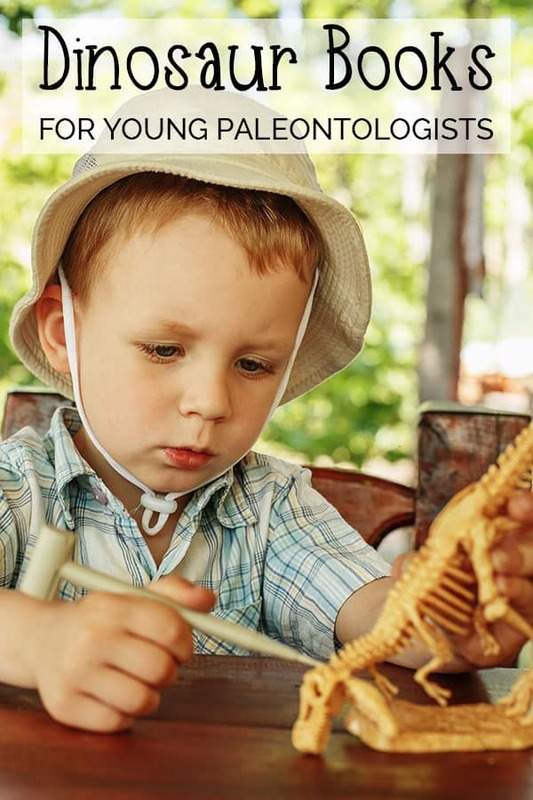 Both my kids have been fascinated by Dinosaur Fossils and although we have had a few fossil kids and made our own their favourite thing has always been the set of dinosaur skeletons that I bought when they were young. They both have always been fascinated by bones. To try and encourage my dinosaur-loving little boy to learn his letters we purchased dinosaur learning resources like this Dinosaur Alphabet Jigsaw and had a lot of fun slotting it together. It was ideal as a quiet time activity as well and would keep him occupied putting it back together whilst his sister napped.